Whaaa so cool !! *^* Do you think it will stay a long time on our nails ? :o Or it won't stick a long time ? It can depend on the brand of nail, and glue, but they are generally pretty durable. I know a waitress that wears long fake nails and her job was really rough on her hands and they held up. I think some nails are even hard to get off and you have to soak to dissolve the glue or something... What often comes first is you have to remove them because your real nails start growing out and the fake one looks 'pushed out'. 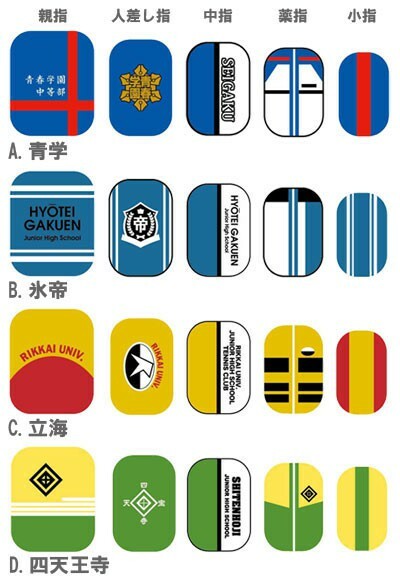 Hehe I see :D And you knew why the Prince of Tennis nail chips are sold by 24 ? I've never worn fake nails, but I see they often give you extra sizes. I'm thinking its because not everyone has the same size nails. Hello! Welcome to my LJ, and thank you for following ^___^ If anything on my sales catches your eyes, please feel free to let me know! Hehehhee I see, well whenever you have less things on order then come back to check my sales! !